1. First, we will have to find the term in which x27 occurs. To find a term implies finding r. So, we will now find r.
(x2+2x )15using the general term. (You must compare the given binomial expansion ( x2 + 2x )15 with the standard form ( x + y )n in order to write x and y in the general term in (A) above). 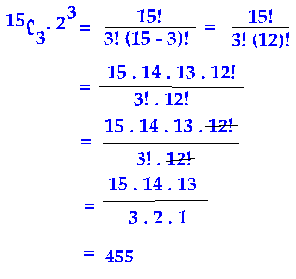 Since we need x27 ,we observe that we must set 27 in 2n – r in (B) above. 2n – r = 27.